The Big Game day is almost here. Are you excited? If you’re like most of us, you know that planning a game day spread can make you absolutely bonkers. For others, all the game day snacking causes havoc on our lifestyles. Big game Sunday stresses me out. It’s a day full of fun and chaos, but trying to make sure I have goodies I can snack out without worrying about my health can often wear me out. This year I hope to change that. While I help you with some healthy snack alternatives Sav-A-Lot is going to help you in the grocery budget department. These little guys might be missing the dough bottom, but they still pack a whole lot of taste! Zucchini, Turkey Pepperoni, Mozzarella Shredded Cheese and Pizza Sauce. Simple ingredients all found at Sav-A-Lot. All the flavor of buffalo wings without the extra calories. While wings can be a good staple item on a low carb lifestyle, on days like game days, its easy to lose track and eat your weight in calories. To battle this, we’ve taken the hot flavor of wing sauce and paired it with the cream and bite of blue cheese for a much lower calorie option. Wash your head of cauliflower and cut into florets. In a plastic zip top bag add the cauliflower and hot sauce. Shake the bag until the cauliflower is coated. Place in oven and bake for about 15 minutes, depending on how crunchy you want your bites. Switch your oven to broil and leave in for 1-2 minutes or until blue cheese has melted. When I get a craving for chips and salsa, I reach for the celery. I get the same great crunch and all the salsa goodness. For those wanting chips for their salsa, Sav-A-Lot has a great dipping tortilla chip. I even found these awesome dry roasted peanuts; which make a great game day snack, too! When I checked the label I was pretty happy that they are fairly low in net carbs! Bonus! As a kid I loved eating celery with peanut butter and raisins. Who remembers ants on a log? Maybe we should call the low carb version bits on a log? Hmmm that just doesn’t sound right somehow. This is another super easy snack. 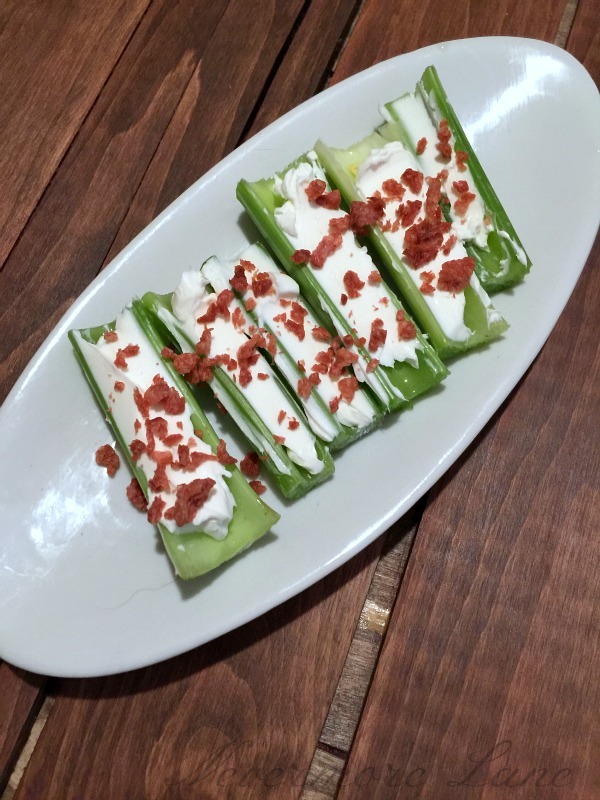 Put some cream cheese in the celery and sprinkle with bacon bits; all of which can be found at Sav-A-Lot. When it comes time for me to make snacks for a room full of people, I try to make things which incorporate the same ingredients. That’s why I used celery with the buffalo bites, the salsa and the bits on a log. It helps to save money when you can use ingredients for more than one recipe. Same thing with the cream cheese. 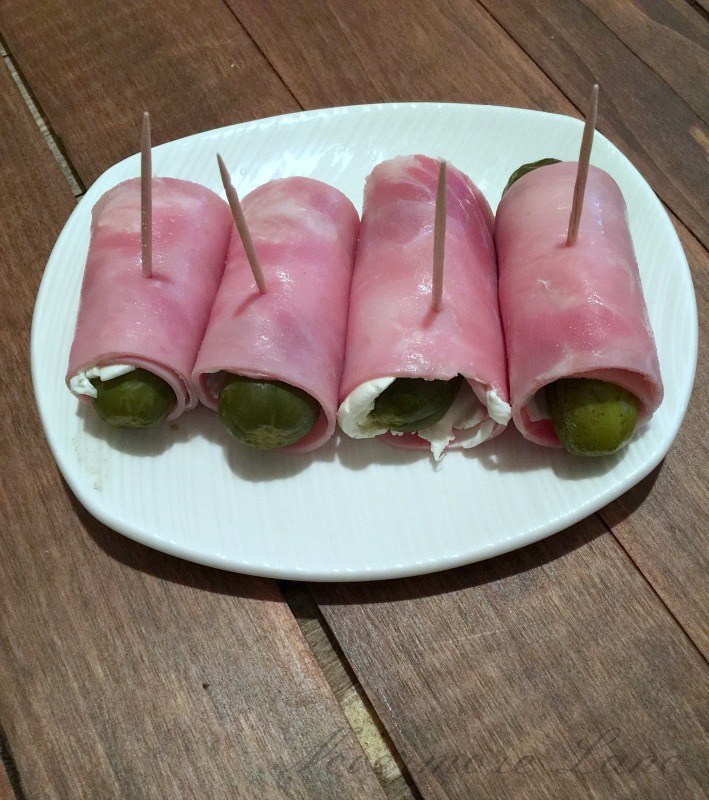 I used part of the block of cream cheese for the celery and the other part on these ham rolls up! Do you like pinwheels? I know I do, but my body doesn’t like the tortillas or wraps. To cut the bread, I use the ham as the roll up and don’t bother slicing them because I use midget dills. 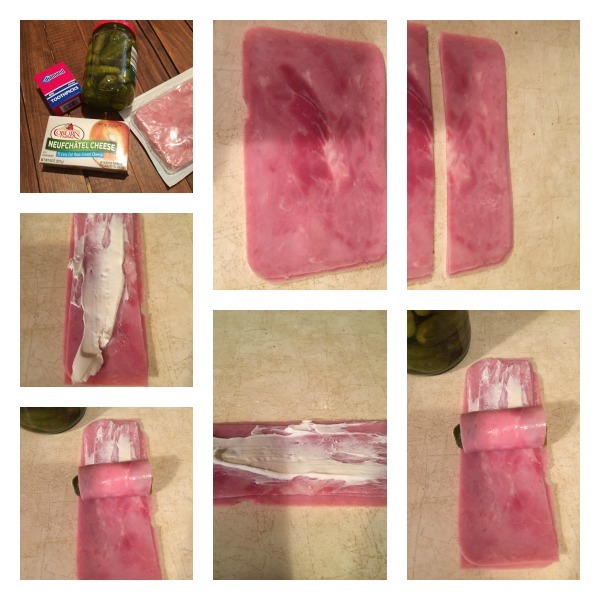 TIPS: If you’re worried about the extra sodium, rinse the ham and pickles with water and blot dry. This will help with some of that extra sodium. Now that you have all these great, healthy recipes for your game day snack-a-thon, Sav-A-Lot and myself would like to help you out with your grocery savings by offering you a chance to win one of TWO $25 Sav-A-Lot gift cards. How about 30 more low carb recipes ??? Just click to get’em ! I’d love to know 1) how are you planning to stay healthy on game day and 2) what could this $25 Sav-A-Lot gift card do for you? I wish I could eat more of them! Between my PCOS, stomach/intestine issues and the immune disorder, most carbs just wreck my system with bloating, cramps and inflammation. So, I try to eat very little of them. I am trying to get onto the low-carb train it’s not easy for me but I am working on it. I’m going to have to try a couple of these recipes because they look great and I need something low-carb that actually taste good. The zucchini pizza bites look awesome! I love how pizza dough was substituted for a veggie that I love. I’ll make this for my boys for game day. As long as there is cheese in it, they’ll love it. My kids are the same way. If i put cheese on something they will always eat it. All those recipes look so delicious and not too difficult to make either. I’m always up to try new things for Game Day. Thanks for the recipes. Thank you, thank you, thank you!! 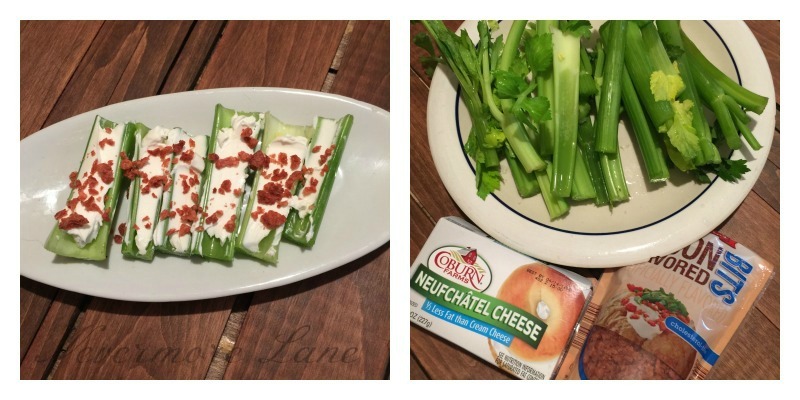 Low carb snacks are so hard to find ideas for! When I’m counting calories, having things that are low in carbs makes a huge difference. Thanks for posting this!! I’d love to try all of these especially the low carb pizza bites. Another one that I think would be a hit with all of us is the low carb buffalo bites. These are great! It would be nice to have some healthy options. Those zucchini would be fun. These look so yummy! And they are perfect for the lo carb diet my husband and I have adopted in the new year! 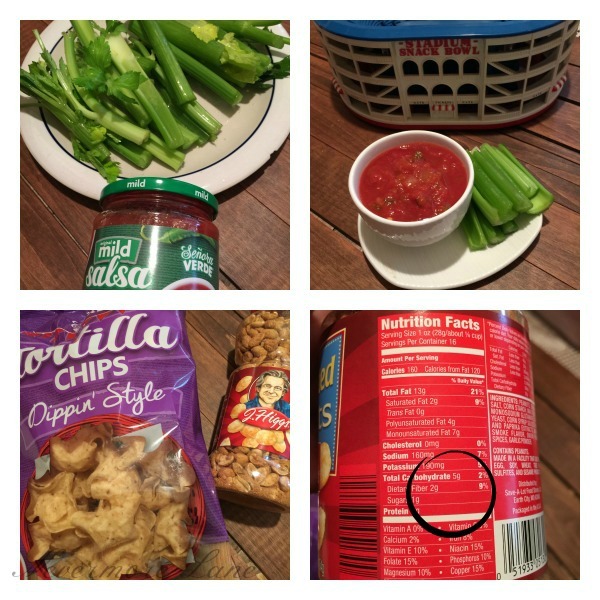 I don’t watch the Super Bowl but I’m loving these low carb snack ideas. Low-carb snacks are always welcome in our house. This is a great and healthy way to enjoy the game. I’ve been wanting to try zucchini pizza bites so I think I may make some this weekend. My family loves salsa with everything so that’s a great choice for us. These look like great game day snacks!! 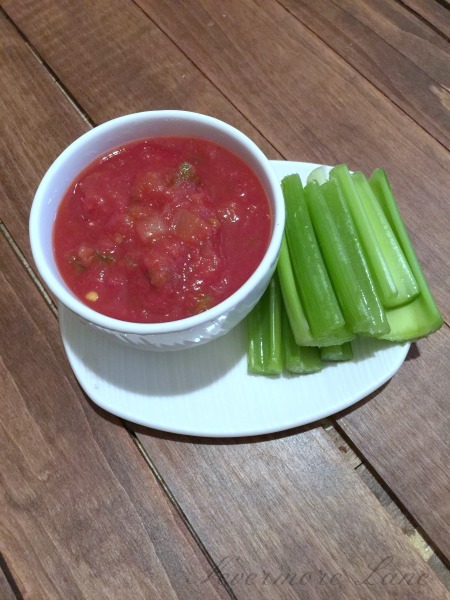 I am a huge chips and salsa lover and I don’t know if celery and salsa will be as fulfilling but I would try it!! Oh wow!! This looks absolutely delicious. We haven’t tried these snacks before but it looks worth a try, plus it’s healthier! I love just how we can make the cauliflower taste great. It’s just like tofu — works like a canvas — and we can put more flavorful sauces to it without having to worry much about the calories. I just love cauliflower. For the longest time it was my go-to for many things. Trying to make use of it much more lately! What a yummy snack! I can’t wait to try this. My family will love this for sure. The zucchini pizza bits sounds and look delicious! I also love the idea of the celery, looks pretty tasty! The zucchini pizza bites look so delicious! I would love to try to put these together and see how the family takes to them – I am sure they would be a hit. These all look like great snacks. I can’t wait to try all of them, I have been trying to eat less carbs. All of those snacks look so good. You don’t need a ton of carbs to have amazing game day nom noms. Thanks! These look like some great low carb options! My husband is on a low carb diet right now so he will love these. These are all great snack ideas. I will have to try the Ham and Cheese roll ups first. I love those zucchini pizzas…I make something similar but I bread the zucchini and cook them first then add the sauce and cheese. 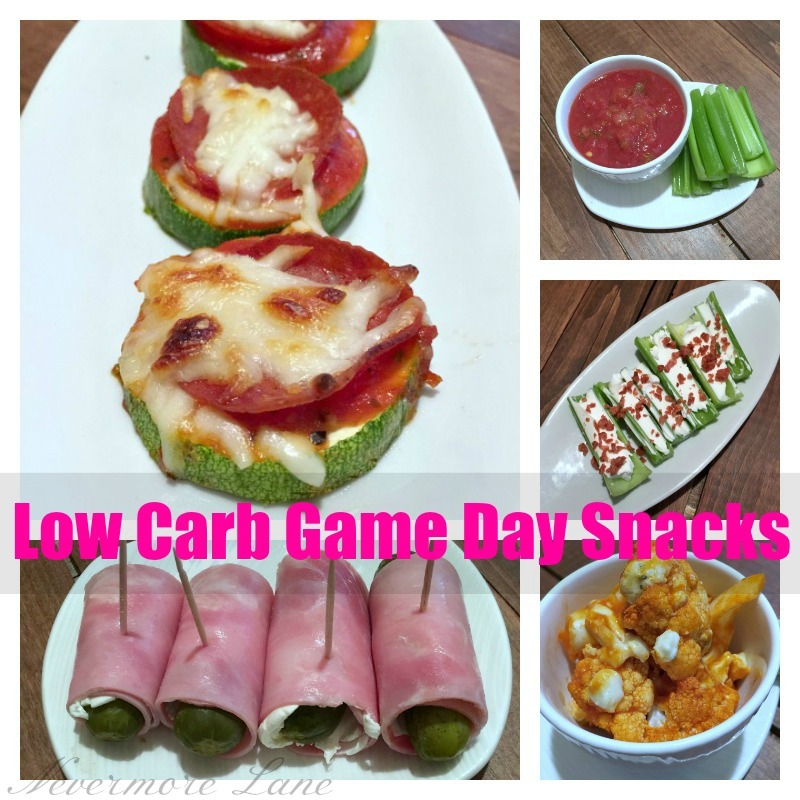 These are all great low carb snacks for game day. 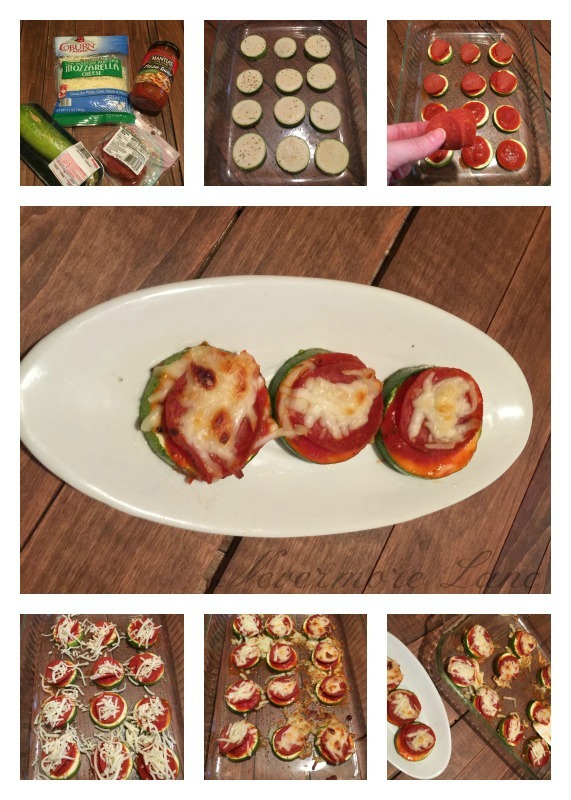 I would love to try the low carb zucchini pizza bites sound and look delicious. Thanks for sharing the ideas. Great ideas! I love game day food but the options are usually so unhealthy so it’s nice to see something that won’t make me gain 10 pounds. 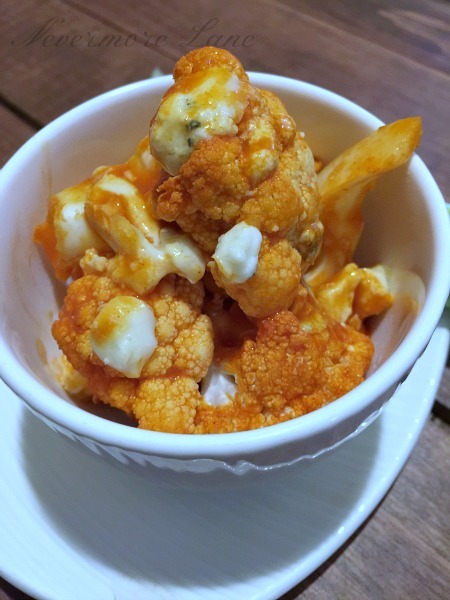 Those cauliflower buffalo cheese bites look right up my alley. Perfect low carb treat for game day. I may have to try those out sometime too. I never get to use cauliflower! These all look and sound good. I bet they will be loved by many on low carb diets! All of these appetizer suggestions sound great. I could not pass up that celery, cream cheese and bacon! These snacks are genius! Each time I scrolled past one I thought it was my favorite before arriving at the next one. Great for the upcoming football games. I make those ham and cheese roll ups all the time. They are so good! All these others look amazing as well! I need to try out that califlower recipe. Yummy! These are awesome game day snacks! The first thing on my shopping list is always fresh veggies for game day. These are such awesome ideas! 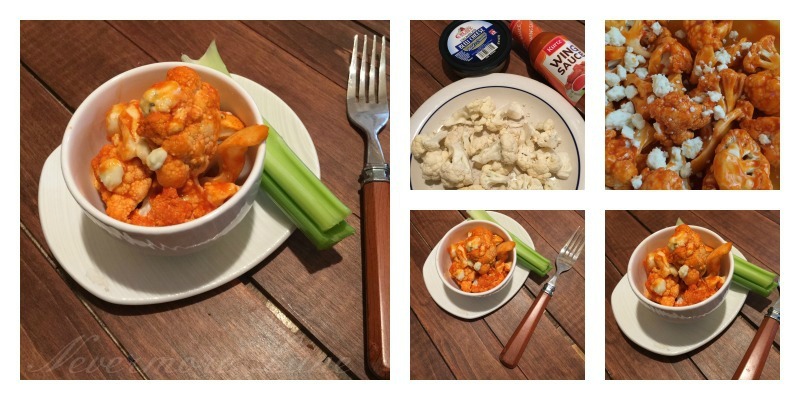 I am definitely going to try the cauliflower recipe, we are pepper bellies in my house and we love the taste of wings, but I personally would love to have a healthier option. Thanks so much for sharing! Great ideas for no carb snacks. My family would really enjoy these. I especially like the pizza idea! These look so awesome. My hubby is diabetic so he watches his sugars and carbs. I think the first thing on my list would be that cauliflower to make your recipe. That pizza needs to happen immediately. They all look like an awesome addition to any tailgating party, however. I’ll have to try the Cauliflower Buffalo Blue Cheese Bites sometime. They look delicious in every sense of the word! Love your options! Can’t wait to try some of the recipes! Yummy! Those pizza zucchini bites look so good! I’ll be making them for my family for sure! I just bought a zucchini shredder thing for pasta and I want to add more veggies to my diet. Thank you for sharing so many yummy low carb snacks. Many of the typical snacks are just laden with carbs, whcih I cannot have. Actually, the first thing on my grocery list is something to drink. That’s always the first thing we run out of. 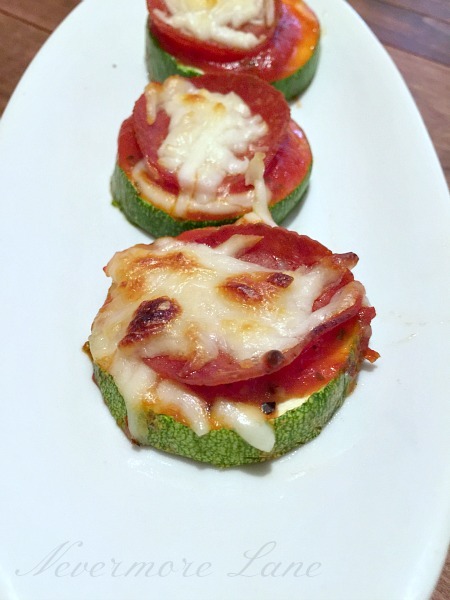 I’ve had the Zucchini Pizza Boats that are similar to this. I love the bite-size snacks shown here. The Buffalo Blue Cheese Bites is something I’d definitely like to make in the future. The first thing on my list is Greek yogurt. Meat, we’re carnivores around here. First thing on my list is Herdez salsa. The best price ever at Save a Lot! Milk and bread are always the first thing on my list. These all look like good snack items. I’d most likly try the caulifower. These are great ideas! I love veggies and so these are right up my alley! I love all of these ideas! I was making the dessert for the big game so i’ll see if I can sneak one of these snacks too maybe eat semi healthy! These are superb low carb ideas for game day snacks! I’d love to try the cauliflower buffalo bites. Great ideas! I only eat low carb so this looks absolutely great for us!